Many of you know that I live in the country, several miles outside of the thriving metropolis of Eldorado, Texas — population much less than 2000. We have fairly decent EDGE wireless coverage here, but there are areas where the signal typically dips to one bar — and it seems like many of those places are either on the highway between San Angelo and Eldorado or in various spots on the ranch where we typically drive. I took care of our low signal issues at home when I installed the Wi-Ex zBoost, but signal strength in our vehicles has continued to be a sore spot. 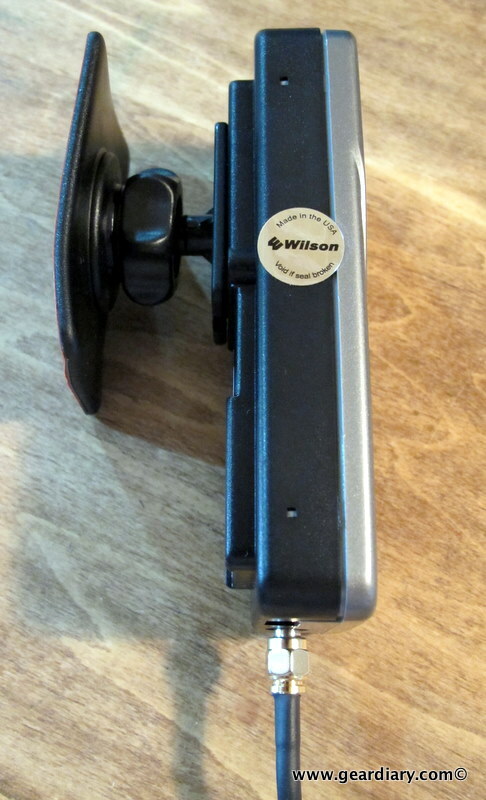 When I was offered the chance to review the Wilson Electronics MobilePro Wireless Cellular/PCS Dual-Band 800/1900 MHz Amplifier, I’ll admit that I was pretty skeptical. Not only is the wireless amplifier much smaller than the Wi-Ex’s, the base package is $100 less. I mean, sometimes you get what you pay for, right? Then there was the fact that the kit was completely transferable – not only between vehicles but also from vehicle to inside the house. I’ve been using this kit for some time, and I’m now ready to pass a verdict. But first, let’s talk about what’s in the kit. 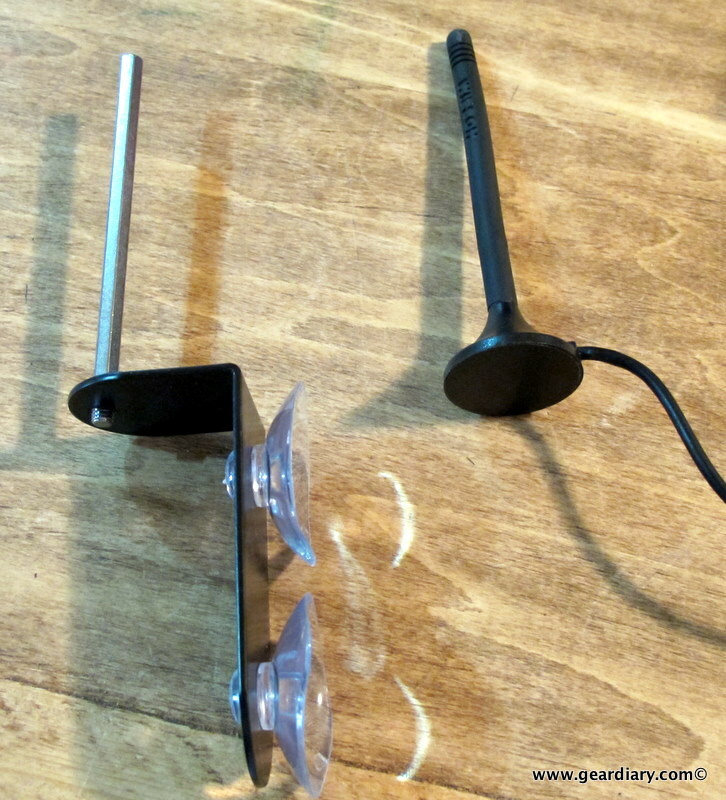 There are two kits available which are essentially the same but include different magnet mount antennas for vehicle or home use. Both include a suction-cup window bracket for the exterior antenna, an AC power supply, and a travel bag. 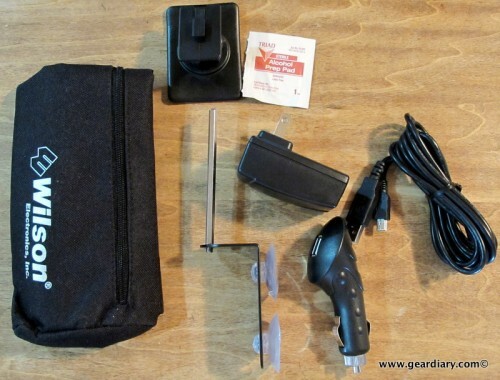 I received the version (801242) which includes 6″ magnet mount antenna (which can be used indoors or in vehicle) and a DC charger; the other version (801241) includes a 12″ magnet mount antenna and a DC charger. One really cool thing about either kit is that they each use a USB cable to connect the wireless amplifier to the power source (AC or DC), and a USB port on a computer can also serve as the power source. The wireless amplifier has slots on its back to accommodate the included adhesive swivel bracket; you can also purchase a patch of double-stick Velcro tape if you need to install the mount to a carpeted area. The amplifier is supposed to be installed as close to the cellphone as possible, in fact the back of the driver’s headrest is suggested if you regularly travel through “particularly weak signal areas”. The included mount will work well on dashboard flat spots or on the side of the center console. 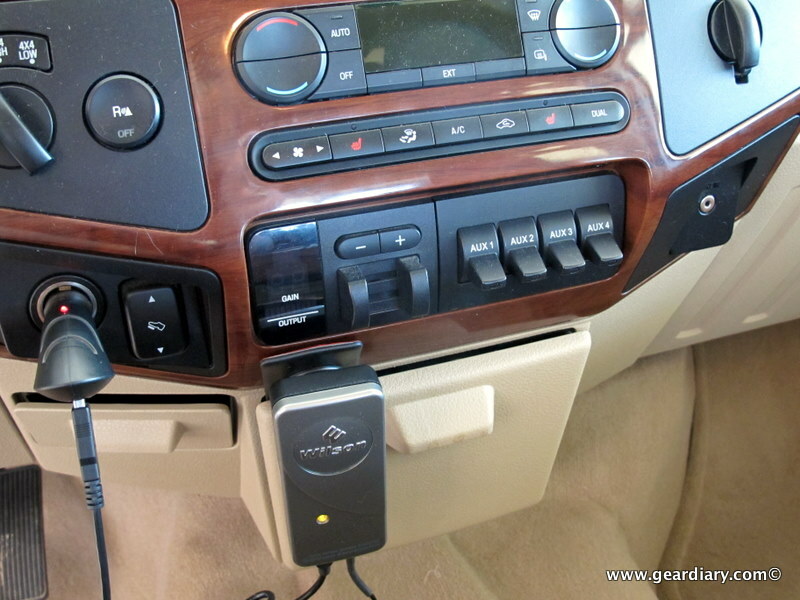 The mini magnet mount antenna is meant to be be attached to the top of the vehicle, and the window bracket is what you’ll use to set up the system indoors. So here’s the installation rundown for in-home use: attach the magnetic antenna to the window mount, place it as high as possible on the window where you get the best signal, and keep the antenna as vertical as possible. connect the coaxial antenna cable to the wireless amplifier box if you haven’t already, and then attach the USB cable to the wireless amplifier. You can then decide if you want to use AC power or USB power. You should always have the antenna attached before you plug in the power supply. Vehicle installation is just as simple, but before we jump in, I’m going to show you the signal I get inside my truck in my front yard — two bars, which is better than some areas, but not so great for in-call voice quality, and it’s pretty sketchy for data transfer. Here is my truck’s console – lots of smooth areas to stick the adhesive swivel mount. It even clamps quite nicely into the closed cupholder. The DC power cable is plugged into the USB cable, and the magnetic antenna is attached to the coaxial cable port. Power is supplied to the wireless amplifier and a light is glowing. The antenna needs to be mounted 8′ away from the amplifier, or oscillation can occur and the amplifier will power down. If you see the amber light, you need to move the antenna further back; the light will glow green when the two are far enough apart. 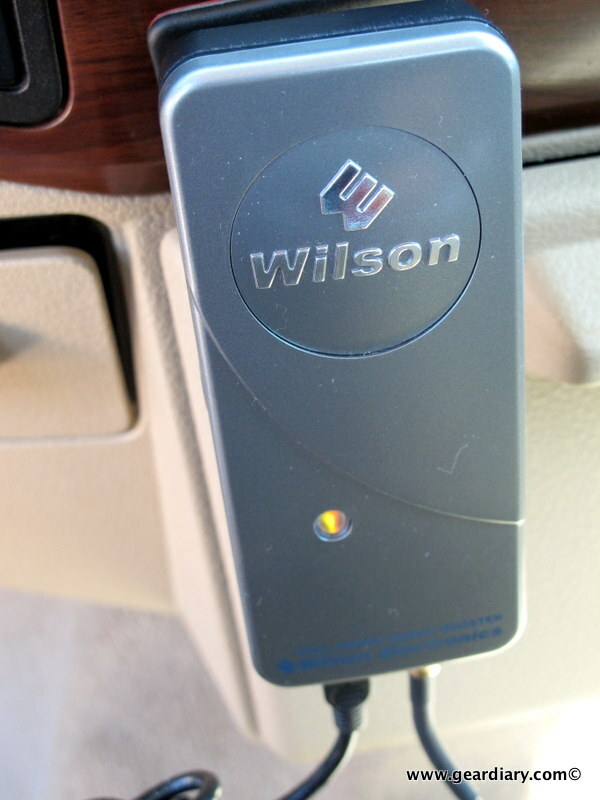 I have a nice flat window in the back of my truck, but Wilson Electronics advises against using that in-vehicle. They say that using the glass-mount can cause an oscillation which may continuously shut down the amplifier, so it is best to mount the antenna on top of the rear roof of the car, but no further than 8 – 12″ from the door since you have to run the coaxial cable and you don’t want there to be much slack. 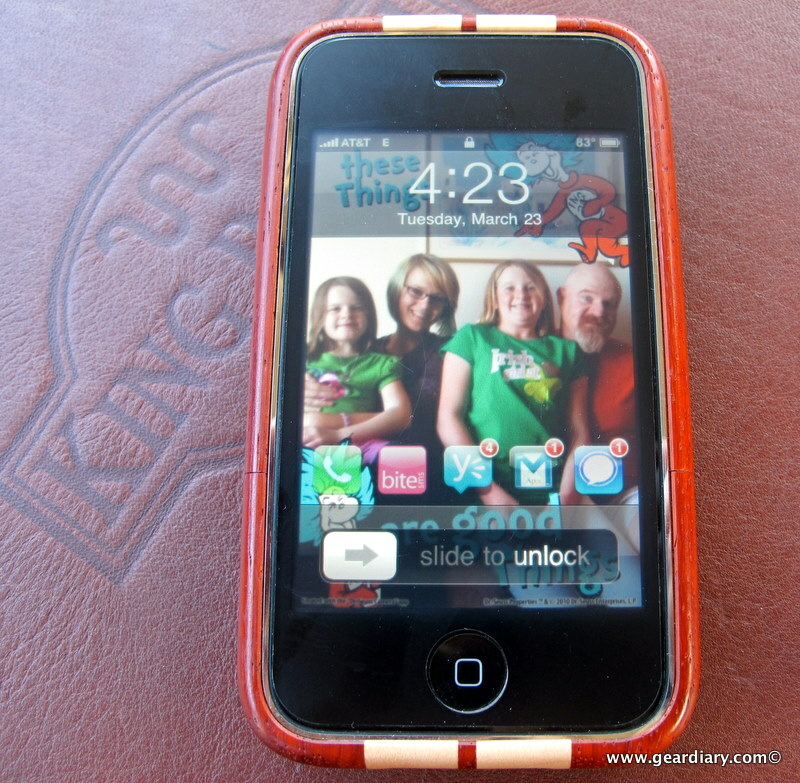 So everything is properly installed, and this is the final result — five bars — which is as good as it gets. Call quality is excellent, and data works properly as well. I noticed when driving through normally poor areas (where the bars would normally flat-line, but the No Service designation would not display) that the signal still maintained at least two bars — which is not bad at all! Vehicle installation can be as complicated and custom as you want it to be (i.e. – fitting the coaxial cable under door seals and hiding all wires), or as temporary as you need (attach the antenna, plug it in, go! ); this is the idea setup for rental cars or people who have more than one vehicle. You can buy as many mounts as you need for as many vehicles as you might transfer the system between. You can keep a glass mount attached in your home or office, and you can transfer the wireless amplifier and magnetic antenna to it when needed. If you find yourself transferring the system often, you’ll be glad for the included travel bag, which will keep all your goodies safely stowed in between uses. I have been pleasantly impressed by the MobilePro during my testing. I almost feel guilty for doubting the weight of the wireless amplifier, because I now have no doubt that it works exactly as advertised. I love the vehicle and building transfer possibilities that this system offers, and while it may not be as strong as some larger setups offered by Wilson Electronics or other wireless extender companies, it is more than adequate for my needs. 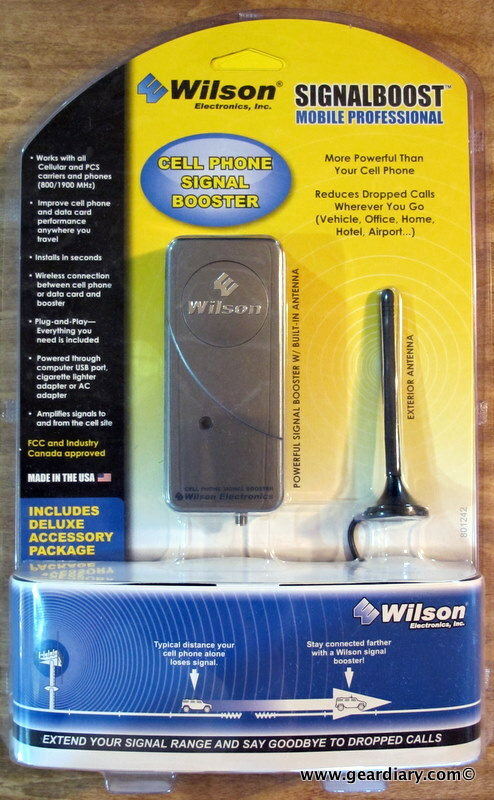 If you live, work, or drive places that have poor coverage — but you can still get a signal even if not much of one, then you ought to give the Wilson Electronics MobilePro a try. The Wilson Electronics MobilePro Wireless Cellular/PCS Dual-Band 800/1900 MHz Amplifier is available from various online and local retailers. 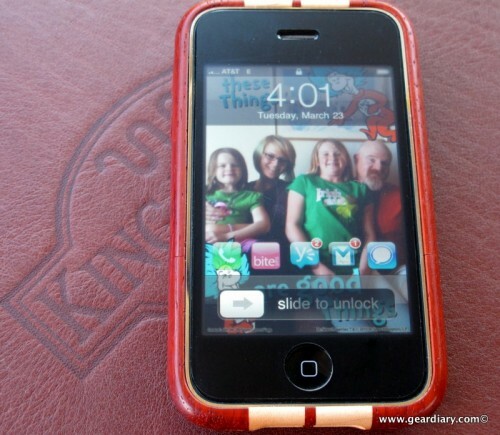 MSRP: $269.95 — but prices vary wildly depending upon which retailer you purchase from – be sure to do your research!